The weekend before last started off with the lovely stomach flu. David woke up in the middle of the night throwing up, it lasted about 24 hours with him. Steve started throwing up sunday afternoon and I woke up sunday night or monday morning witht he crap and 2 days later I was finally able to move. The throwing up wasn't so bad, but I felt like someone beat every inch of my body. I felt brused and battered it wasn't a nice flu bug... Then Colton whacked his eye with one of those sticky hands so I had to take him to the eye dr, because it looked bad! The doctor looked at it with the glow in the dark dye and everything was all good. He had some minor abrassions, but nothing in the cornea. I thought everything was good until wednesday, we had managed to get to hockey and school with no one sick! Then wednesday I get the call that Colton is sick and I need to come get him ten minutes after school started. So he missed wednesday and thursday of school. On top of all of that I have had this awful sinus headache, and stuffy head earache stuff that I have been fighting for about a month. I went to the dr. today and he shot me up with some kind of allergy stuff, gave me a perscription, and some eye drops, because I looked like I had pink eye in both eyes. I am already feeling better from that and hopefully the shot keeps the allgeries at bay. I am so happy the eye drops stopped the itching as soon as I used them life got better. We did manage to get the back deck finished, made it to every hockey practice, and even made it to school early for David's student council meetings! I was totally impressed with my accomplishments, but then most days just getting the boys to school before the bell rings is a major accomplishment for us! Friday nights game was played much better, and even though we suffered a lose the boys at least played. The blackhawks goalie was on fire, and Budaj, which is pronunced Boo-die not Bud-age, played an awesome game. It was a goalie game that is for sure and the boys all played with some effort. Steve is on vacation, and I take back all the "wish he was home more" statements I made last week. Now I have to make it through this week with him here! The boys have hockey tomorrow, and then monday I will be at school all day, tuesday is hockey night, and we have hockey thrusday so I should do alright! What the hell happened to the AVS? They played a very sloppy game of hockey. Their passing skills where on the same level as a mite team in the 3rd period, and when someone did manage to get a pass off flawlessly the person they passed to couldn't pick the puck up if it had been the size of a freaking basketball. They had absolutely no control of the puck what so ever, they just knocked it around the ice, no looking where they were passing, not knowing where the puck was half the time. Sloppy Hockey boys very sloppy! I love my AVS, and they can play beautiful hockey, Monday nights games was a perfect example, but tonight was sad. I don't expect them to win all the time, but I do expect the same thing from them as I expect from my own children, to put forth their very best effort. Tonight's game lacked much effort. Friday I expect better, weather you win or lose boys let put forth the effort. Play a smooth game of hockey, make every pass count, work that puck down the ice, be ready for the passes, and for god sakes get someone in front of the damn net you are wasting your scoring opportunities when your whole damn line is behind the net fighting each other for the puck. I am going to get my coaching certificate and help coach the little kids, that might be a little scary for them and for me, but I figured what the hell I might as well. The price of oil needs to go down a great deal, not because of the price at the pump, but it is seriously cutting into quality time with my husband. He has been gone so much the last 2 months that when he does show up I check ID at the door just to make sure he really is who is says he is, and it won't stop until the price of oil goes down and they stop all this damn drilling!. Speaking of jobs if anyone wants a job in the oil field and you have a CDL I know where you can go to work today drop me an email and I'll hook you up. It is kind of like a job in the Army you know see the world while your earning money except you don't see the world just a whole lot of the rockies mountain states and you earn a lot more money, and by that I am not saying you will be paid well, just better than the government would pay you. We dug through gear Monday night to make sure both boys had everything and it all fit, and then David says, "mom you didn't get my skates sharpened!" Well that was just peachie, one more thing on my list of things to get done Tuesday! I took the boys to school, came home threw a roast in the crock pot, got showered and dressed, started a load of laundry. I sat down looked at the clock and it was time to go get Colton, so I grabbed up the skates and ran out the door. I managed to get the skates to the ice rink just as the guy who sharpens them was leaving so I did some quick begging and he took pity on me and stayed to put an edge on the skates. I have to get Cam some socks and a helmet still. We got Cameron dressed, and left for the rink a little after five. He was so excited to finally be getting to play hockey. We got to the rink, picked up his skates and got them on his little feet, along with David's helmet. He waddled off to the bench to wait for the zamboni to finish up so he could get out there. I was a little scared that he wasn't going to like skating. The last time we went he skated for about 15 minutes, fell down, and decided he was cold and was ready to take his skates off. I had no reason to worry really. He skated out with no help and the whole night he only fell a few times and he got right back up. I didn't get to watch as much as I would have liked as we had a parent meeting, which is pretty much to welcome the new parents and give them all the information and sign up to be team parents. I signed up for both boys this year. We got out of the meeting and I had to run to the locker room, because we have a new rink manager and he doesn't want the kids dressing in the lobby, which is just crazy because our locker rooms are the size of a large bathroom and trying to get 40 kids and 40 parents in there is not going to happen. So I took David in to help him get dressed, he can get most all his gear on by himself, but still needs a little help getting his garter and socks fixed right and getting his skates laced up tight. 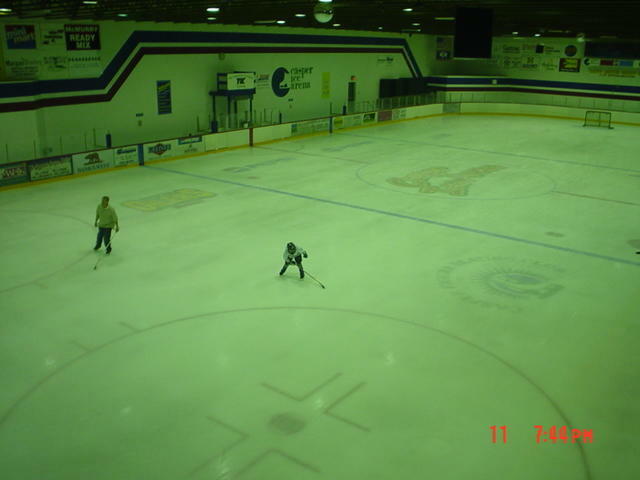 I told the D man to get his stuff on and I ran out and got Cam as he was coming off the ice. We rushed into the locker room, I snatched Cam's skates off, got the socks that the boys had to share, because we managed to get to the rink with the one pair, and managed to get David's skates laced up and have him out the locker room door before his ice time started. I was impressed with our ability to get one dressed and the other one undressed in record time! Then I ran back up the stairs to make it to David's parent meeting! Over all things went really well and it can only get easier from here! The dues are paid and tomorrow it's time to take the ice and drop the puck! David and Cam are both playing this year. 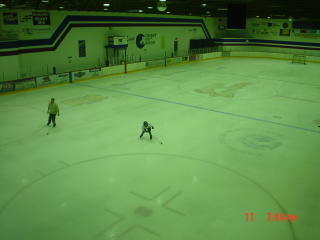 David can hardly wait to get back on the ice. Cam is excited because his cousin is playing as well. 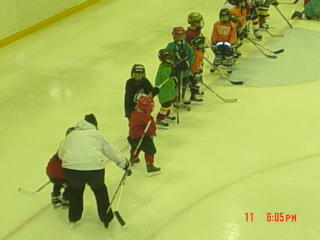 I am not as excited, tuesdays we will be at the rink from 5:30 until after 8 so that makes for a long night. The boys will have to come home get homework done and a snack and then we will have to dress Cam and head out the door so he can be on the ice! David will have to bring whatever homework he has left and him and I can work on it while Cam is on the ice and vice versa! I usually try to get them in bed by 9, but tuesdays we will be lucky to get to bed by 10 after they come home and eat and all of that! I can hardly wait until they get to play some games though. There is nothing more fun than to watch your kids play a sport! Colton and I were sitting on the couch together when he looks at me and says, "Mom, you are getting kind of old." He then takes my arm, pulls it up to his face, takes a big sniff and says, "But you smell great!" I guess that I am not so old that I am rotting. 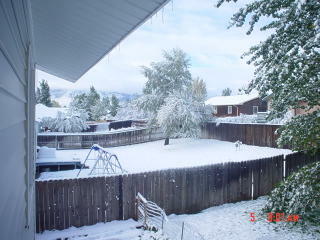 This is what we woke up to this morning! I love the first snow of the fall. It is so pretty, and it isn't all that cold. In fact today the sun is shining and the snow will soon be gone! I have been busy at the school with the boys. Last Friday they had PDA. I don't remember what the hell that stands for, but the teacher have meetings all day and the kids get to do fun kinds of things. This time we got to see snakes and lizards. I was with the pre school and kindergarten classes and they thought it was pretty awesome. We saw a cobra, rattlesnake, blue rock lizard, and some other stuff. Mondays I am in Cam's class helping with centers, and then David wants me to start going to his class once a week as well. So I will have 3 days a week at the school. Cam has been sick with stomach pain and the school nurse called yesterday for me to come and get him. I took him to the Dr., because he said it was not like a stomach ache, but more like a burning pain. The Dr. said that the lining of his stomach has been irritated, and put him on zantac. I am suppose to give that to him 2 times a day for 5 days, take him off, and see if the pain comes back. If it does start again then he has an ulcer. I have put off going to walmart for the past 2 weeks, and we are quickly running out of everything around here. I think Colton and I will go after I pick him up from school. David starts hockey next week, and Cam has decided that he wants to play as well. We will be spending much of our time at the ice rink this year. David has practice Tuesdays, Thursdays, and Sundays, and Cam will practice Tuesdays and Sundays. We should just pack a bag and camp out down there! Well that is all I can think of today.